In the 1980s and 1990s, I looked forward to tagging along to Nigerian weddings with my parents because I was sure to eat this brown cake there. My brother and I called it chocolate cake so yes, this was also how Nigerian Chocolate Cake (without using chocolate lol) was made. 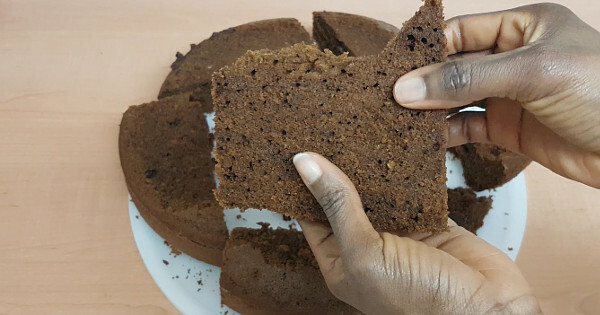 These days, western chocolate cakes are very common in Nigeria. But the brown Nigerian wedding cake will always be my go to “Chocolate Cake”. This cake was in vogue when royal icing was the trend in cake decoration. The quantities of ingredients listed below are what I used for a cake that I baked with a 10 inch diameter and 2.5 inch deep cake pan. If you do not want to use the plain flour (all purpose flour) and corn flour/starch mixture, use 4 cups of cake flour. I used brown sugar in the video below because it adds its own nice flavour to this cake but traditionally granulated sugar is used. The eggs and butter should be at room temperature. Which mean that before you make the cake, bring these two out of the fridge long before you will make the cake. If it is winter where you live, bring them out the night before. Peak Filled Evaporated milk had a unique rich creamy flavour that works well with the vanilla and butterscotch flavours. Prepare the cake pan: rub butter inside the pan, pour some flour into the greased pan, shake it such that the flour touches every part of the inside of the pan, then pour out the flour. Set the pan aside. Mix lemon juice and milk. Set aside. Mix the all purpose flour, corn flour and baking powder in a bowl. Set aside. Cream vanilla flavour, butter scotch, butter and sugar for 1 minute. Add eggs 2 at a time. Add two eggs, mix till well combined, add the next two etc till all the eggs have been added this way. Add the milk and lemon juice mixture. Sift the flour mixture and fold with a spatula. See the video below for how to fold a cake mixture. Add the browning and mix till the colour is well combined with the rest of the cake mixture. Pour into the pan we prepared earlier. That's how to make the Classic Nigerian Wedding Cake. This cake is also great for birthday cakes, Christmas cakes or cakes you just want to keep in your freezer and munch on when you feel like something moist and delicious. Watch the video below to see how I used this cake for my daughter's birthday cake. You can serve it up as a snack with a chilled drink or eat it as a dessert. When decorated, use for birthdays and weddings. This Classic Nigerian Wedding Cake Recipe is originally published at www.allnigerianrecipes.com. The recipe details how to make the Classic Nigerian Wedding Cake.